"The battle for paradise has begun." The ninth big-sceen feature in the Star Trek film franchise finds the Next Generation crew battling to save the peaceful Ba'Ku inhabitants of a Shangri-la-like planet from destruction. When Data mysteriously malfunctions while on a mission, Captain Picard learns he has uncovered a conspiracy that threatens Starfleet's Prime Directive of noninterference. A renegade Starfleet admiral has made a deal with a grotesquely aging alien race to force the Ba'Ku, who haven't aged in 309 years, from their home to access their planet's unique healing properties. While on the planet, the Enterprise crew experiences the fountain-of-youth advantages of the environment. Picard has a romance with a Ba'Ku woman, Geordi's eyesight returns, Troi and Dr. Crusher begin to feel younger and Worf finds himself going through puberty again. The Ba'Ku don't believe in violence or modern technology, but Captain Picard implores them to work with the Enterprise crew in order to save their planet from annihilation. 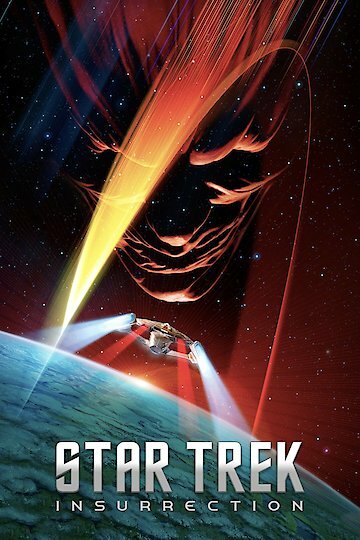 Star Trek: Insurrection is currently available to watch free on Tubi TV and stream, download, buy on demand at Amazon Prime, Amazon, Vudu, Google Play, YouTube VOD online.